The view Monday from the Independence Civic Center toward the Independence Hotel under construction. The city of Independence wanted a riverside hotel and now it’s getting one. To learn how the town of 10,000 did it, I took the 20-minute drive there from Albany on Monday. At the Independence Civic Center, a $13 million project completed in 2011, I talked with David Clyne, the city manager retiring at the end of this year, and Shawn Irvine, the city’s economic development director. Back at my desk later, I also talked on the phone with John McArdle, the mayor of Independence since 1999. 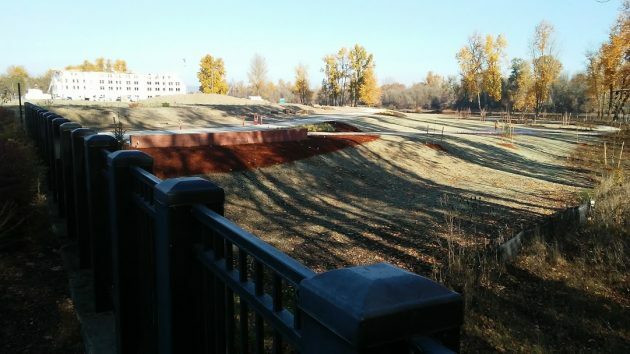 The hotel is just one part of what’s become known as Independence Landing, which also includes a sprawling park on the Willamette and 110 planned apartments and 14 townhouses above the river’s floodplain. So how did they do it? Then there was money, geography and opportunity. In 2000 the city formed an urban renewal district that helped finance things. When a riverside gravel and ready-mix company folded, the city acquired the land along with a former railroad right of way along the river. Then the town spent about $3 million to make the land suitable for development. Finally, the city negotiated development agreements. The main one is with Tokola Properties of Gresham, which is building the 75-room Independence Hotel along with the apartments and townhouses. One of the conditions: They had to build the hotel first. Independence wants the hotel as part of its plan to bring more people to its downtown, dressed up with “streetscape” improvements and refurbished historical buildings over the last few years. The town counts on becoming a destination for people visiting Polk County’s growing wine industry. It also expects Western Oregon University in neighboring Monmouth to be a draw for potential guests. Clyne told me the city would not have supported the development financially without a good prospect of returns. It expects around $600,000 a year in revenue from hotel property and room taxes. There are a whole lot of dollar figures and other eye-glazing details that I’m not getting into here. If you want them, check the material available on Independence Landing here. David Clyne, left, and Shawn Irvine with Independence’s plan for riverfront development. I think AIRBNB’s will prevail and place hotels in a non-competitive disadvantage. Recently stayed at one in Moab,UT. very nice with enclosed parking at excellent price–sleeps 8.-full kitchen. Be careful what you wish for cause time changes everything. McArdle’s lopsided victory bodes well for Mayor Konopa who was re-elected by a equally impressive margin. Konopa for 12 years or more and McCardle since 1999. It looks like a couple of fiefdoms in the making. No one, except Charlie (can’t think of his last name..which fortifies my point) will run against Mayor Konopa. The position doesn’t have a salary, but takes a lot of time and effort. Sharon has a husband who supports her. Small towns of 50,000 or less should have either a mayor or city manager, but not both. If Albany had no mayor, the council could share the ribbon-cutting type duties. The city manager, who is well paid, should take care of the rest of the duties. Mayor McArdle’s re-election is symbolic of the leadership he has provided to Independence. He is a man of vision, action and cooperative nature. A true pleasure to work with. Negativism, like Cordier, Shadle, and Jacobson, divides people and hinders progress. There’s much negative chatter about the Mayor and the Council. As a newcomer, I don’t get it. For the mostpart, the expectef functions of the City operate well. Clarify: lower costs of local gov’t spending. A few years ago we collected >5000 signatures forcing a vote on a measure to require voter approval before the Council could go into more taxpayer debt. Passed overwhelmingly. Did the mayor or council heed that? No they went around the will of the voters and continued to increase debt via urban renewal —millions with no time limit. The staff develops budget–city mgr defends his people–mayor criticizes council attempts to scale back so we never have a plan to reduce costs. So happy I don’t have to tolerate your BS any more Ray. I did not say the City did not follow the rules. Indeed the State allowed City to enact UR w/o voter approval because our Charter did not require our approval. So the shadow gov’ spenders prevailed. I’m going somewhere? (Or maybe you are?) I’m sure you’ll see my name here going forward… Quite thankfully, for many years now, CARA & ARA have been able to see through your backwards thinking. And that’s with many changes of the people involved with it over time. It’s an issue of control, not services or delivery. Management by plebiscite may work when everyone can fit in one room. Obviously that can’t apply to city government. Ahhhh……but do they have a merry-go-round? To keep up with negativism to please Mr Woods….. To call that hotel in Independence a “riverside” location I’d say it’s fairly close to the river not exactly beside it. But nay Mr Wood, Albany has something of the sort in those yet to be fully developed houses @ Hill & Water. Which by the way CARA blows off $40K on each when/as they are completed. To bad for meaningful dialogue Mr Woods that you find an opposing view so offending and wish to demonize the writer. Mr. Engel, May I suggest you visit Independence and the hotel site? It is indeed a riverside location that takes full advantage of the beautiful views and access to our lovely downtown. I suppose you’d rather see a huge pile of rubble leftover from the old restaurant and drive no property taxes from the site? (What’s your plan?) While it’s taking longer than anyone had hoped, it *IS* happening. As a 26 year resident and current City Council member in Independence, I find the above discussion interesting. All of you are from Albany and have no dog in this race. Independence has thrived under the leadership of Mayor John McArdle AND City Manager David Clyne. The Manager/Mayor structure works just fine for us and I am proud to say the council works well with both of these fine leaders. How about allowing Independence to thrive in its success and take your petty bickering to an appropriate forum?